Shop Boss CS3 Compressor Sustainer Pedal from AMS with 0% Interest Payment Plans and Free Shipping. 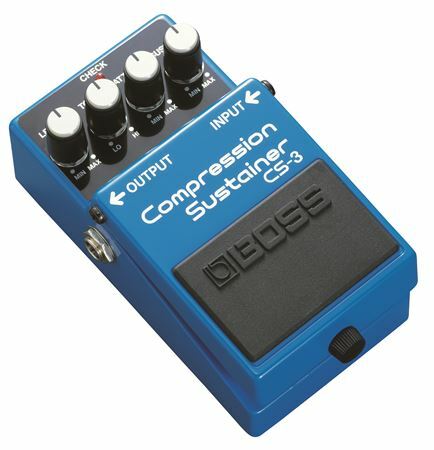 The Boss CS3 Compression Sustainer Pedal is the secret behind countless top guitarists' tone! Don't know what a guitar compressor is for? You're not alone. Half the people that own them don't either. But used right, that is, sparingly, the CS3 can give you that powerful, clean on-the-edge sound that stands out without distortion. It can also push your amp over the top and give your distortion endless sustain at much lower volumes. Put it first in line - sustain control low, Attack control up for starters, adjust volume to boost, and tone to taste. Experiment. An invaluable pedal. The CS3 compresses high-input signals while boosting low-input signals, giving you smooth sustain without degrading the quality of the original sound. A range of effects from gentle compression to squeezed sounds is at your command. Designed for outstanding low-noise performance, the CS3 also provides EQ for precise sonic control. Great product! Thanks American Music Supply!! Easy to use , very clean and responsive I would highly recommend ! Sounds great!!! Give my guitar that extra punch in tone I’m looking for. There are few substitutes for that particular Compression Sustainer sound of Boss. From the most subtle to that extreme "popping" attack sound, this pedal can provide the whole gamut of tones expected from a compression sustainer pedal. The best compressor sustainer I have used in that price range. Made a difference as soon as I hooked up my 12 string guitar. I have played with many compressors and the Boss CS3 does everything the more expensive ones can do. Very pleased with this pedal! Here the CS3 is ideal for solos in ballads or mellow songs. Add a Chorus effect for even more depth. This setting balances the volume of each string for smooth chord accompaniment. Add Chorus and Delay after the Sustain effect. This setting is good when playing sustaining chords.